In late September (of an election year), one class session is devoted to developing a list of issues key to the class and likely to be discussed by the candidates. The list is converted into 3-5 questions all students will research and answer. Each student is assigned a candidate (President, Governor, congress, state legislature). An effort is made to assign each student a candidate who will appear on his/her ballot and to assign third party candidates. 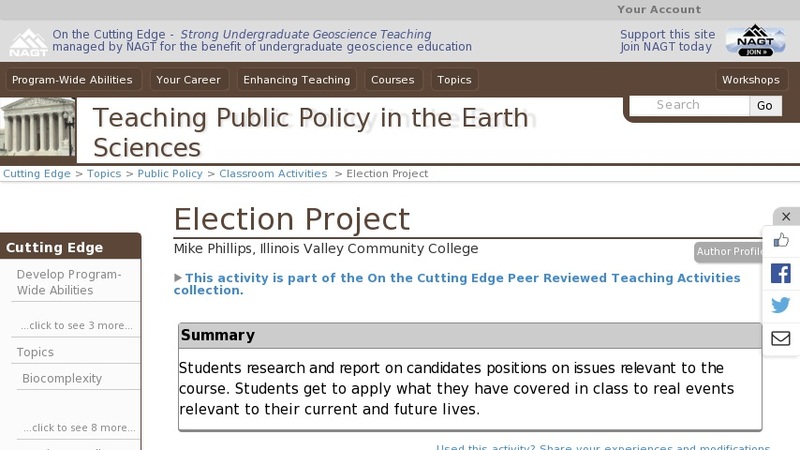 Student research candidates' positions using web resources, news papers, and campaign materials. Students are strongly encouraged to contact the campaign directly and question the candidate, if possible. Students report back to the class with a 3-5 minute presentation and a poster that may be displayed in a college commons area. Reports are presented a week prior to the election.